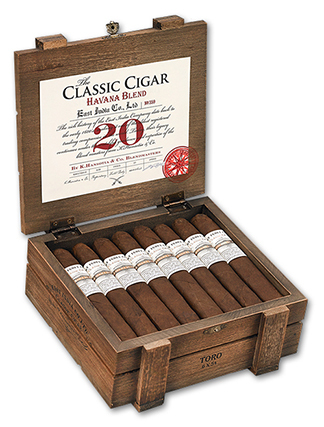 Home » Cigars » Gurkha Classic Havana Blend Cigars by East India Trading Co. The 20th time's a charm with the Classic Cigar: Havana Blend from the East India Trading Company, a subsidiary of Gurkha. That's how many iterations it took to perfect the blend of proprietary Nicaraguan fillers and binder, and then find just the right wrapper to complement it. Well worth the effort, the Classic Cigar: Havana Blend is a medium-bodied, Cubanesque cigar finished with a beautiful Mexican San Andres wrapper. Full-flavored with earthy, nutty, and spicy undertones and touches of sweetness, these handcrafted, box-pressed cigars are produced at American Caribbean Tobacco S.A. in Esteli, Nicaragua. According to Juan Lopez, National Sales Director and a member of the East India blending team, it took several years to create this Nicaraguan masterpiece and is considered to be the company's best creation yet.